What does the Typhoon Imager do? The Typhoon FLA 9500 is a variable mode laser scanner for quantification of proteins, nucleic acids and other biomolecules. It has the following imaging capabilities: multifluorescence, chemifluorescence, chemiluminescence, radioisotopic and colorimetric. It can be routinely used for imaging of blots, gels, tissue sections, arrays and phosphor screens. The advantage of the Typhoon system is that it can accurately quantitate multiple biological samples with a high dynamic linear range. 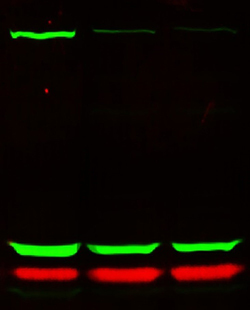 Quantitative Fluorescent Western Blotting – This is an example of multiplex protein detection (protein of interest + loading control) using the Typhoon FLA 9500 imager. Note: The signal obtained is quantitative and has lower background compared to traditional approaches.